High precision rotatable satellite antenna positioner for use in professional satellite communication systems. The Hiltron HMAM is a complete high precision motorized satellite antenna mount for use in professional civil and military satellite systems. It combines affordability with the reliability and precision expected of professional-grade communications equipment. The HMAM motorized satellite antenna mount is designed for two-way VSAT communication or receive only downlink applications. It includes high-grade drives for azimuth and elevation plus a high-accuracy polarization drive and is fully compatible with our standard HACU antenna positioning system. A combined head and drive are incorporated, forming a three axis motorized system with 180 degrees of azimuth adjustment, 90 degrees of elevation adjustment range and fully adjustable polarization. Positioning accuracy is +/- 0.02 degrees and position-display resolution is 0.01 degrees. The antenna control unit and associated motor-control electronics are contained in an IP65-rated weatherproof outdoor housing with a hinged front access port secured by dual key screws. An emergency cut-off switch is accessible to the left of this housing. The figure below (right) shows the interior of the antenna control unit . Above the housing is a resolver which is used to measure the azimuth angle of the antenna. A second identical resolver allows constant monitoring of antenna elevation. The azimuth and elevation drive motors are operating each through a reduction gear. 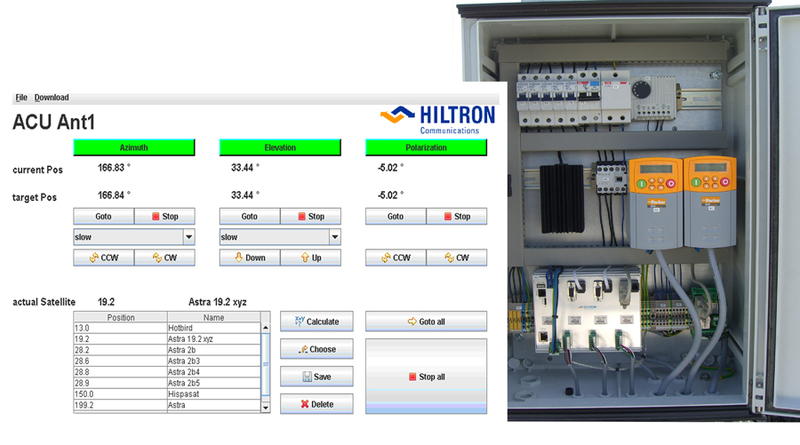 The antenna control unit is designed for IP-based control from a PC running a graphic user interface compatible with standard web browsers. The control GUI (see Figure above, left) displays all the information required to set and maintain azimuth, elevation and polarization, including current position and target position plus a database of potentially accessible satellites. Once a satellite is selected, precise access parameters can be calculated at the press of a single button. Supplied with the HMAM is a flexible support plate allowing the attachment of all kinds of reflectors with a diameter between 1.2 and 2.7 metres. The entire system is built to withstand standard atmospheric pollutants and to operate from zero to 95 per cent humidity over a temperature range of 25°C (option 55°C) down to -25°C. As an option the entire system can be built to withstand pollutants such as salt encountered in coastal and industrial areas. The rotating pedestal mount is made of corrosion-resistant hot-dip galvanized steel. Azimuth movement is accomplished via an axle bearing with a drive motor and allows the entire satellite arc to be covered from any position on the planet. Elevation movement is via a jackscrew with a further drive motor. This design and the use of resolver-angle indicators provide highly reliable and very accurate positioning far beyond the stability of commercial grade actuator devices. The very high rigidity of the construction ensures essentially zero backlash. The HMAM can operate in winds of up to 125 km/h and survive up to 200 km/h. Total weight excluding the dish itself is up to 200 kg. 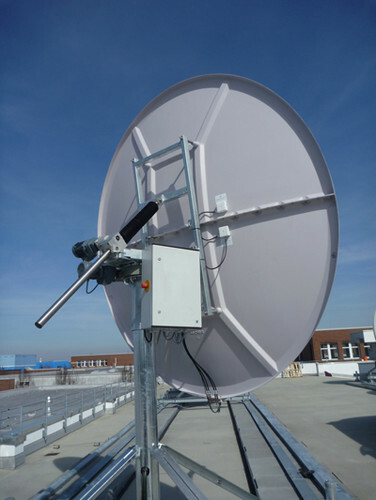 Options for the Hiltron HMAM motorized antenna mount include a satellite tracking system, inclined orbit tracking, integration of parabolic reflectors according to customer preference, de-ice systems, and a choice of standard steel mounts or non-penetrating mounts. .
All kinds of reflectors with a diameter between 1.2 and 2.7 meters can be attached. IP-based control from a PC running a graphic user interface compatible with standard web browsers. The ACU and the associated motor-control electronics are contained in an IP65-rated weatherproof outdoor housing.